It was 1958, and President Eisenhower was presiding over the post-war boom. 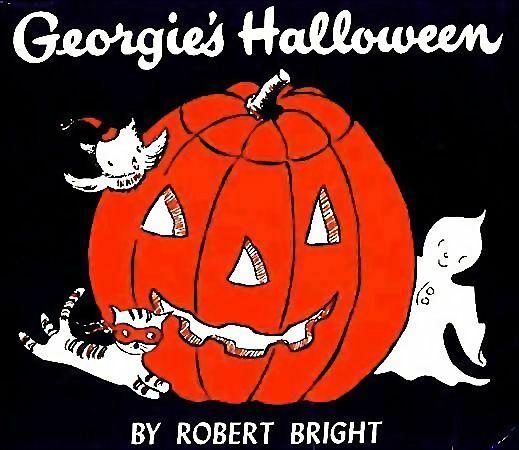 And illustrator Robert Bright decided to write a gentle children’s book about a charming little ghost named Georgie. Bright had already written stories where George meets a magician and some attic-pilfering robbers. But eventually, he’d end up writing a book about Georgie’s Halloween. Bright really outdoes himself with this book’s illustrations. The moonlit house and the nighttime party scene both lend themselves to exciting effects with light and shadows. The white spaces seems to be the gleam of moonlight, and the dark lines turn into stark shadowy highlights. And in a two-page drawing, the light spaces are complemented by the orange of the children’s costumes. Georgie hides behind a corn stalk, but the cat and the owl urge him on. And when he finally arrives, the children shout “It’s Georgie! It’s GEORGIE!” The happy ghost runs home to tell his mouse friends about his triumph. When he gets home, the mice will present him with their own award for best costume of all.